Human height is the classic example of a quantitative trait: its distribution is continuous, presumably because it is influenced by variation at a very large number of genes, most with a small effect (Fisher, 1918). Yet height is also strongly affected by the environment: average height in many countries increased during the last century and the children of immigrants are often taller than relatives in their country of origin – in both cases presumably due to changing diet and other environmental factors (Cavalli-Sforza and Bodmer, 1971; Grasgruber et al., 2016; NCD Risk Factor Collaboration, 2016). This makes it very difficult to determine the cause of geographic patterns for height, such as the ‘latitudinal cline’ seen in Europe (Figure 1). Distribution of average male height in Europe, calculated from studies performed between 1999–2013. 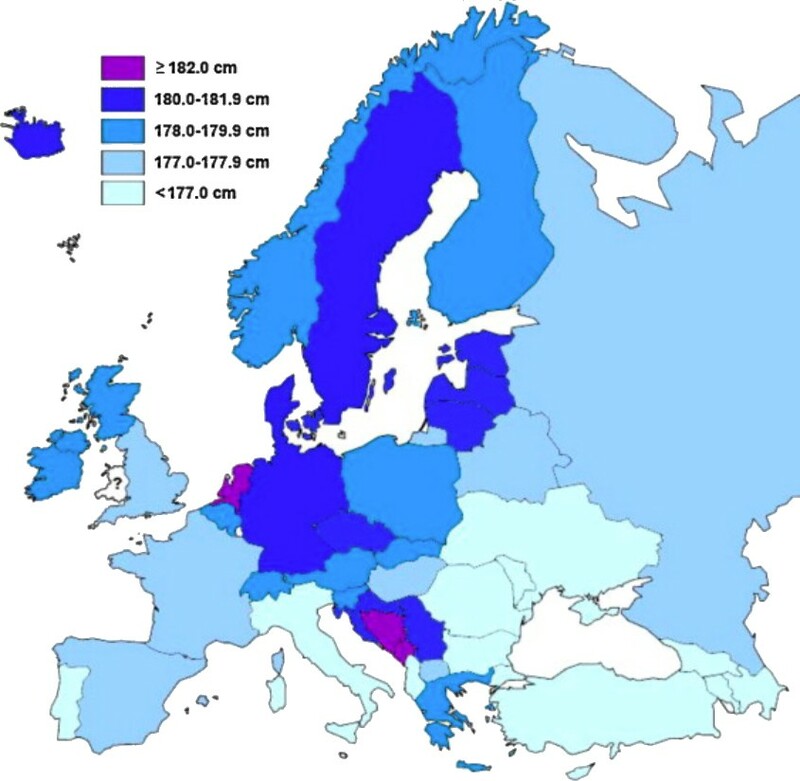 In general, southern Europeans tend to be shorter than northern Europeans. Image reproduced from Grasgruber et al., 2014 (CC BY 3.0). Are such patterns caused by environmental or genetic differences – or by a complex combination of both? And to the extent that genetic differences are involved, do they reflect selection or simply random history? A number of recent papers have relied on so-called Genome-Wide Association Studies (GWAS) to address these questions, and reported strong evidence for both genetics and selection. Now, in eLife, two papers – one by Jeremy Berg, Arbel Harpak, Nasa Sinnott-Armstrong and colleagues (Berg et al., 2019); the other by Mashaal Sohail, Robert Maier and colleagues (Sohail et al., 2019) – independently reject these conclusions. Even more importantly, they identify problems with GWAS that have broader implications for human genetics. Economics & Human Biology 15:81–100. Economics & Human Biology 21:172–195. The New York Times. Accessed January 1, 2019. Evolution, Medicine, and Public Health 2019:26–34. We thank Jeremy Berg and Peter Visscher for answering our questions, and Molly Przeworski for helpful discussions. © 2019, Barton et al. Genetic predictions of height differ among human populations and these differences have been interpreted as evidence of polygenic adaptation. These differences were first detected using SNPs genome-wide significantly associated with height, and shown to grow stronger when large numbers of sub-significant SNPs were included, leading to excitement about the prospect of analyzing large fractions of the genome to detect polygenic adaptation for multiple traits. Previous studies of height have been based on SNP effect size measurements in the GIANT Consortium meta-analysis. Here we repeat the analyses in the UK Biobank, a much more homogeneously designed study. We show that polygenic adaptation signals based on large numbers of SNPs below genome-wide significance are extremely sensitive to biases due to uncorrected population stratification. More generally, our results imply that typical constructions of polygenic scores are sensitive to population stratification and that population-level differences should be interpreted with caution.